Do you ever struggle with the pie crust? 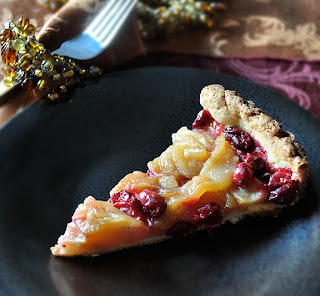 I love making pies at the holiday, but I will admit, my crust is more "rustic" than perfect. I bought a pie dish with fluted edges, in fact, just so I could get a decent-looking pie out of the oven. They taste good, don't get me wrong. But there are moments where I am rolling the dough and it's just not going my way, and I think, "Whoever made up the saying 'easy as pie?'" It's not that easy. Well, here's easy for you. So easy, no oven is required. 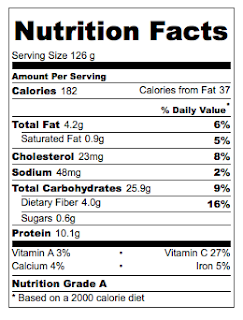 And no eggs, either in case you have an egg allergy in the family. Place 1/4 cup water in a sauce pan. Add the gelatin and let soften for one minute. Heat the saucepan gently, stirring until the gelatin is well dissolved. In a food processor, add all the other ingredients and blend well. Drizzle in the dissolved gelatin as you pulse. Strain this through a fine mesh sieve over a large measuring cup. Divide the mixture among eight small ramekins or dessert dishes. Place in the refrigerator to chill, at least four hours before dinner. Prepare the bourbon pecan toffee sauce. When cooled, top the panna cotta with the sauce. You can do this well ahead of dinner, place back in the refrigerator. Relax, you did not have to struggle with pie crust and dessert looks amazing (even though it was very easy). In a 1 1/2- to 2-quart heavy saucepan melt butter over moderate heat. Add brown sugar. Bring mixture to a boil, stir often. Stir in cream and vanilla, reducing the heat to a simmer, and simmer until thickened slightly. In a small saucepan, flame the bourbon, do not do this right under the hood of the stove. Flames will come up out of the pan. Be very careful. Let it burn off, then place a lid over the pot to be sure the flame is out. Add the bourbon to the toffee sauce and stir well. Add the toasted pecans. Allow to cool to room temperature before topping the chilled panna cotta. You can do this ahead, and place the desserts back in the fridge. If you are looking for a new twist on the sticky-sweet marshmallow and sweet potato classic dish, here's an idea for a lighter, healthier (and make-ahead simple) side: Sweet Potato, Kale and Farro. It also makes a great Meatless Monday Main for fall, too, since farro, also known as emmer, offers some protein and fiber. On a greased baking sheet, toss the sweet potato, shallots, sage and olive oil. Roast for 25 minutes, stirring every 5-10 minutes to prevent over-browning, or until the sweet potato cubes are fork tender and golden brown on edges. While the sweet potato is cooking, place the rinsed farro and stock in a saucepan with a lid. Cover and bring to a boil, then reduce heat to a simmer. Simmer for about 20 minutes, or until the grains are al dente and the liquid absorbed. To serve: Combine the sweet potato, cooked farro, and kale and toss gently to combine, seasoning to taste with salt and pepper. Garnish with the dried cranberries and Parmesan. Roast the sweet potatoes and prepare the farro as above. Let cool. Wash and tear the kale, then store in fridge in a plastic bag. Combine the cooled sweet potatoes and farro, and store in fridge. The day of Thanksgiving, while the turkey is out of the oven and resting, cover the farro and sweet potato mixture with foil and reheat in the oven at 325 for 15-20 minutes. Then season, toss with the kale and garnish with the dried cranberries and Parmesan. I looked up the word "feast." It not only means a huge meal, it also means "a delight." Historically, feasts are celebrations that often follow lean times or fasts, or as in a harvest feast (like Thanksgiving) a large meal at the end of the harvest to prepare for the lean winter days ahead. Certainly, the economy is awful and many of us are cutting back right now. In many ways, it feels like we are fasting as a nation. Time-wise, I often feel stretched thin, too. My work schedule is hectic with trying to maximize productivity now, and the bottom line. I feel pulled to do more and more volunteer work in the face of ever-growing needs. With headlines full of occupy Wall Street and budget struggles, escalating obesity rates and food insecurity both, never-ending wars, and a pop culture filled with "celebrities" that seem to be rotting from their own excess ... it feels like a good time to cut back ourselves, to simplify and center ourselves on what is most important — our health and time to enjoy family and friends. This year's menu is inspired so much by my own need to simplify, to eat healthy and well, to enjoy seasonal foods, simply prepared, and shared with loved ones. To spend less, but still have a "delightful" feast. And to create an authentic celebration amidst a period of emotional, financial and cultural "fasting." Seasonal, local, fall flavors like pears, apples and cranberries lend themselves so well to those traditional rich, savory dishes and sauces, and desserts. 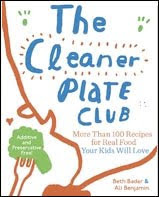 However, they also taste great in lighter dishes — dishes you can feast on, relatively guilt-free and that still fulfill the "delight" aspect of a feast. 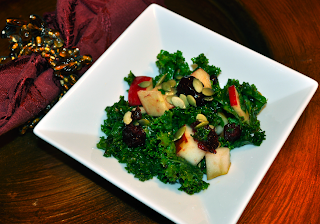 This kale dish is light, very healthy, but full of seasonal goodness with kale, pears, apples, cranberry and pumpkin seeds. I hate throwing out leftover salad that wilts from the dressing, it's wasteful. The kale here stands up to the dressing, and you can save the leftovers for the next day! By tossing the fruit with the vinaigrette, it prevents browning and you can do the chopping and prep well in advance of the meal, making it easier on you, too. The day before Thanksgiving, wash the kale and remove the stems. Tear into small pieces, and dry in a salad spinner. Store in a plastic bag, in the vegetable crisper of the fridge, with a paper towel to absorb excess moisture. Add the pumpkin seeds and dried cranberries together in a small container. Three hours before dinner, whisk the salad dressing together and fold in the apple and pear. Store in the refrigerator. Before dinner, place the kale on a platter, blend the dressing and fruit again in case the oil has separated. Toss the kale with the fruit and dressing. Sprinkle the pumpkin seeds and dried cranberries on top. This should just take minutes. I have a small thing about pumpkins. Okay, not so small. And, it's true that I stock up on about 200 lbs. (or more) of pumpkins, squash and sweet potatoes annually. Before you contact "Hoarders" with my info, just know that I do actually cook my stash. And bury the evidence in the compost heap. By spring, no one would ever know. I have an alibi that smells like pumpkin bread, too. And soup. And pie. Cookies, cake, stew, gratin ... the latest recipe is for bread, though. 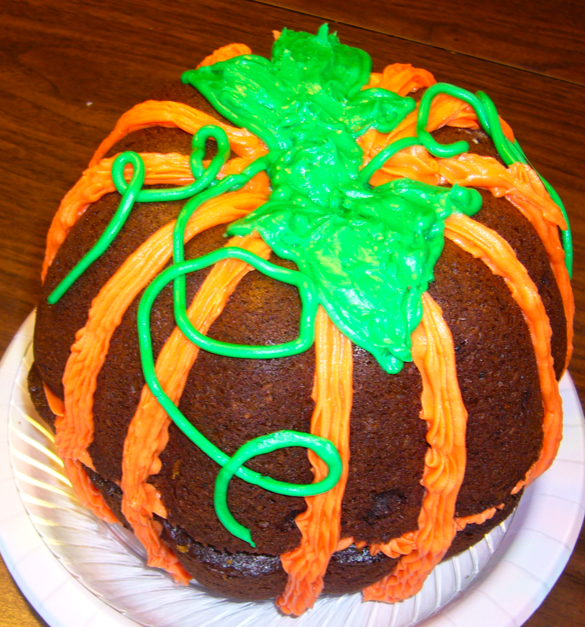 You can make this into a cake, however, or muffins or cupcakes. 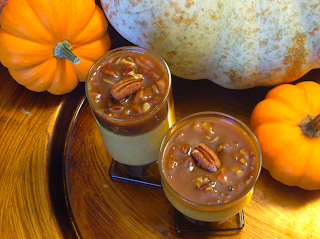 First, decide what type of pumpkin dessert you want here. For a loaf pan, use 9x5x3. For muffins, you'll make about 12 normal sized muffins. If you are making a cake, you may have to double the batch depending on your cake pan of choice. You'll need to base the cooking time for a cake on the recipes that come with the pan there. Preheat oven to 350. Grease or line your pan/muffin pan/cupcake papers, etc..
First, mix the dry ingredients well with a whisk. This makes sure the spices and leavening are evenly distributed. It's harder to do this if you add the dry ingredients one at a time to the wet ones. Next, in your mixer bowl, add all the "wet" ingredients, and mix well. Add the dry ingredients slowly, mixing on low speed as you go. Beat on higher speed for a minute. Fold in the candied ginger. Raisins, if you like them. • For cake, "guesstimate" the time from recipes that come with your cake pan, check in advance of the time so you don't overcook. 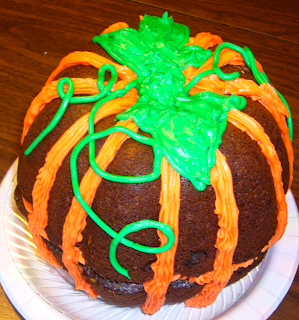 My cute little pumpkin cake pan took about 50 minutes. Check to be sure they are done in center, of course. If this is a dessert such as cake or cupcake, or you just love cream cheese frosting, because, who doesn't, then you might like the recipe below. Mix the butter and cream cheese well, add extracts. Beat in two cups of powdered sugar until fluffy. I can recall a lot of stressful holidays growing up. The unattainable quest for the perfect holiday gathering ruled our household for the weeks before the date. It never made sense to me because the "guests" were our family and closest friends — the very people who should love you the most "as is." Now that I am a grown up, well, supposed to be a grown up at least, and it's our house and our kitchen for the Big Meal, I do my best for a stress-free season. Note, this is not an "easy holiday meal" post to lure you in with false hope of whipping out dinner in minutes and having time for that hour massage at the spa before the guests arrive. It's not going to be totally easy. That size of meal for twelve is going to take some effort. I just don't want you or I to stress about it or aim for some kind of unrealistic myth of holiday perfection. Tell your inner perfectionist to, uh, "stuff it" and just breathe. It will be okay. Part of reducing the workload of holidays is making as much ahead as possible. Another bonus is this lets me use the local ingredients I sourced from the farmers market in October. 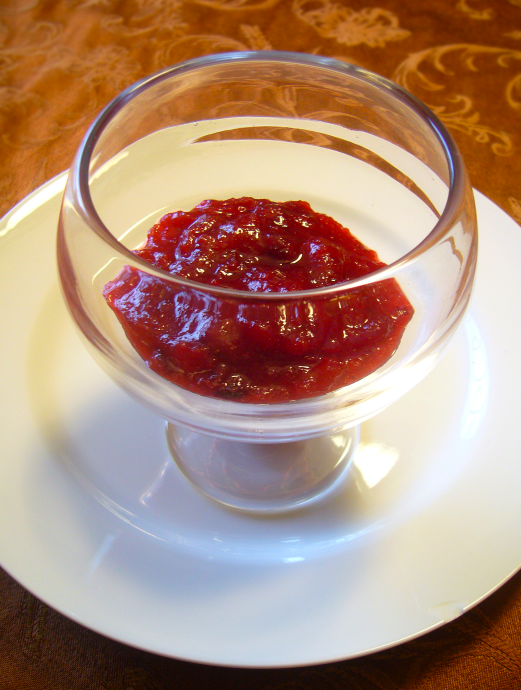 This Cranberry-Applesauce is a nice upgrade on the classic "cranberry sauce" that often appears on Thanksgiving tables in a wiggly, translucent can-shaped form that no one ever eats. How does it come of the can perfectly shaped like that, anyway? You can make this recipe now, and freeze. Just take out of the freezer and put it in the fridge three days before Thanksgiving. Check to make sure it thawed the day before. One dish done and one less worry on the main cooking day. Place the apples and cider in a large pot, cover and heat to a simmer to cook apples. Put cranberries in a smaller saucepan with the brown sugar and honey. Heat on medium until the berries burst and give up their juice and the sauce begins to thicken. Add the cardamom and the five spice powder and mix. Stir the apples to break them up into a chunky "home style" applesauce. Mix in the cranberry sauce. The end result is a lovely red color with a warm and subtle spice to it that goes well with many holiday dishes.